As you age, excess skin forms in the eye area and the skin loses elasticity. Fatty tissue accumulates under the skin, and eyes appear tired, wrinkled or puffy. You look older than you feel—even with a good skin care regimen. Friends, family members and co-workers tell you how tired you look, even when you have gotten a full night’s sleep. Genetic factors and body chemistry can cause these aging effects in younger people. 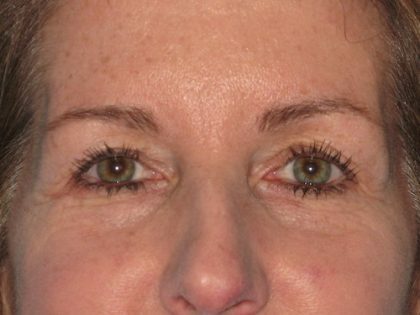 Eyelid surgery by Baltimore-area specialist Dr. Alyson Wells restores a youthful and refreshed appearance to your eyes. Request a consultation online or call (410) 628-8200 to discuss your desires for facial enhancement with Dr. Wells. She looks forward to working with you to achieve your unique aesthetic goals. 3 Are You a Candidate for an Eyelift? 6.1 What can I expect during recovery after eyelid surgery? 6.2 Will my medical insurance pay for eyelid surgery? 6.3 Does eyelid surgery differ between your male and female patients? 6.4 Will eyelid surgery get rid of the dark circles under my eyes? 6.5 How do I know if I need eyelid surgery, a brow lift, or both? 6.6 How much does eyelid surgery cost? Upper and lower eyelid puffiness is often caused by bulging fatty deposits. Upper and lower eyelid lifts (blepharoplasty) strategically remove the excess skin and fat and rejuvenate the eye area. Blepharoplasty surgery provides Baltimore-area women and men with a solution for improving bagginess above and below the eyes and reducing puffiness of the eyelids. Blepharoplasty, however, cannot correct drooping eyebrows or completely eradicate wrinkles. It is often combined with a brow lift, BOTOX® or facelift to improve droopy eyebrows, crow’s feet and facial sagging. Sometimes fine wrinkling of the lower eyelid can be addressed by laser treatments or chemical peels. Eyelid surgery with these options can successfully restore a youthful, revitalized appearance to your eyes for years to come. Excess skin at the upper eyelid can be recognized as the thin, crepey skin that accumulates at the outside corners of the eyes and also folds over the more central portion of the upper lid, obscuring the main part of the eyelid just behind the lashline. This extra skin hinders makeup application. Do you hold and stretch the excess skin in order to evenly apply your eye shadow? 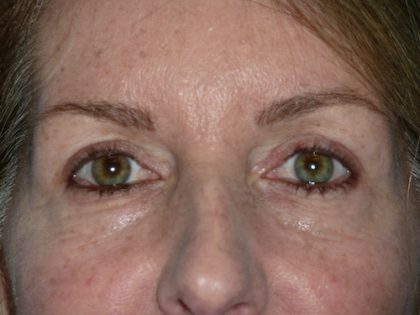 Good candidates for lower eyelid lifts have excess crepey skin below the lash line, and may have bulging areas of fat that give the appearance of “bags” under their eyes. You and Dr. Wells can discuss your problem eye area and what options will work best for you. The incision for upper lid blepharoplasty is placed so that it falls naturally in the crease. The incision for the lower lid blepharoplasty is placed close to the lash line, along the fold of the lower eyelid, to ensure the resulting scar is hidden in the natural contours of your face. Both types of incision heal very well and are usually almost imperceptible. A sense of anxiety about your procedure is normal, whether from excitement or unanswered questions. Because of her years of experience, Dr. Wells understands your feelings and looks forward to the opportunity to provide answers and give you confidence about your procedure. What can I expect during recovery after eyelid surgery? Following your surgery in our accredited surgery center, you will return home or to your hotel with a family member or friend. Those patients who undergo a general anesthetic (not all procedures need this level of sedation) will remain in our recovery room until awake and comfortable prior to returning home. The majority of our patients experience only mild bruising and swelling following their eyelid procedures, and many can return to work within a week. Patients who undergo more extensive procedures may need a longer time off work (approximately 10 days). Will my medical insurance pay for eyelid surgery? Most eyelid lifts (blepharoplasties) are not covered by insurance benefits or health savings accounts. A select group of upper eyelid lifts, usually in older patients with tremendous skin excess, may be covered if objective visual field testing demonstrates that a patient’s vision is impaired and blocked by the overhanging skin and that taping the excess out of the way actually improves the vision. Lower eyelid lifts are not covered by insurance benefits. Dr. Wells is very familiar with the criteria set forth by insurance companies that impact the determination of “medical necessity” and will discuss the testing and likelihood of insurance coverage for the procedure during your consultation if you are possibly a candidate for this approach. Does eyelid surgery differ between your male and female patients? 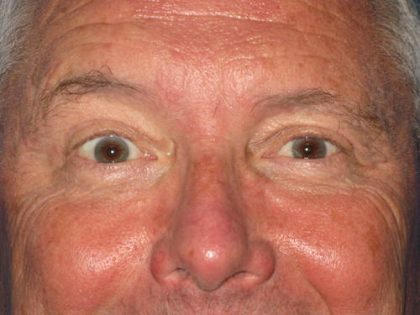 There are some subtle yet extremely important nuances that differentiate eyelid lifts in men and women. The position of the surgical incision, the length of the surgical incision, and the optimal amount of skin removed can be a bit different in men and women. Your procedure will be individualized and customized to address your specific concerns and goals, and your results will be appropriately feminine or more masculine. Will eyelid surgery get rid of the dark circles under my eyes? Lower eyelid blepharoplasty can be helpful in improving or eradicating the dark shadows from this region. It depends on the factors contributing to the dark color. In many circumstances, transfer of micro-particulate fat (either as combined or sometimes as a stand-alone procedure) into this area will be needed to give the most satisfactory results. There are also patients that will benefit from a mid-facelift procedure to address the dark coloration. 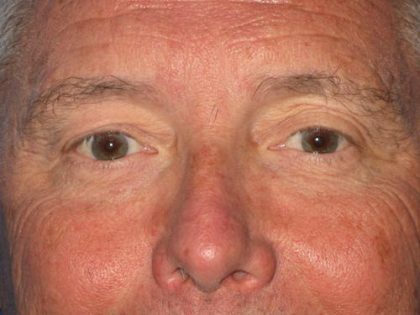 The techniques used by Dr. Wells to improve the area around the eyes are highly individualized and customized to each patient’s particular desires and goals. How do I know if I need eyelid surgery, a brow lift, or both? The good news is that you don’t need to know that when you make your consultation appointment at Valley Plastic Surgery! That is precisely why sophisticated patients choose Dr. Wells — she is board-certified in both plastic surgery and otolaryngology/head and neck surgery, and she helps you decide which procedure, or combination of procedures, is right for you. The fees associated with an eyelid lift (blepharoplasty), similar to other cosmetic procedures, depend upon several factors, so it is difficult to give an absolute cost. This is especially true for eyelid procedures, as they are frequently combined with other facial procedures (laser resurfacing, fat transfer, chemical peels, brow lift), but in some cases can be very comfortably performed with just local numbing medicine and an oral sedative, thus eliminating the cost of anesthesia services. Valley Plastic Surgery is knowledgeable about regional and national trends in costs associated with providing this procedure, including the costs associated with the anesthesia and the operating room, and we strive to be competitive with plastic surgeons in the Baltimore-Washington area. However, some variability in fees throughout the region may reflect use of cheaper and perhaps less satisfactory materials and supplies, less training or experience of the physician performing the procedure if other than a board-certified plastic surgeon, less training of the individual providing the anesthesia if other than a board-certified anesthesiologist, or lack of accreditation of the surgery facility in which the procedure is being performed. In other words, Dr. Wells is a board-certified plastic surgeon and a board-certified otolaryngologist/head and neck surgeon who operates in her own accredited surgery center with a board-certified anesthesiologist providing the anesthesia.